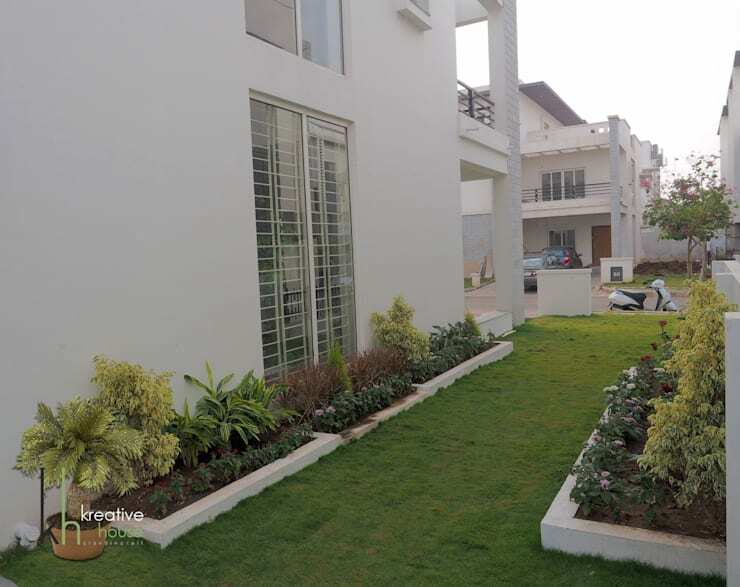 Lawn is a natural and beautiful way to lift the lift of your yard and provide your children, you pets, your family and your friends with a lovely corner of greenery in a home. Grass requires a little bit of maintenance and care, however. This shouldn't put you off though! Today at homify, we've put together some simple tips to ensure that your grass remains green and fresh. You'll really get a chance to enjoy nature with a beautiful lawn! So meet our 10 lawn patios and fall in love. 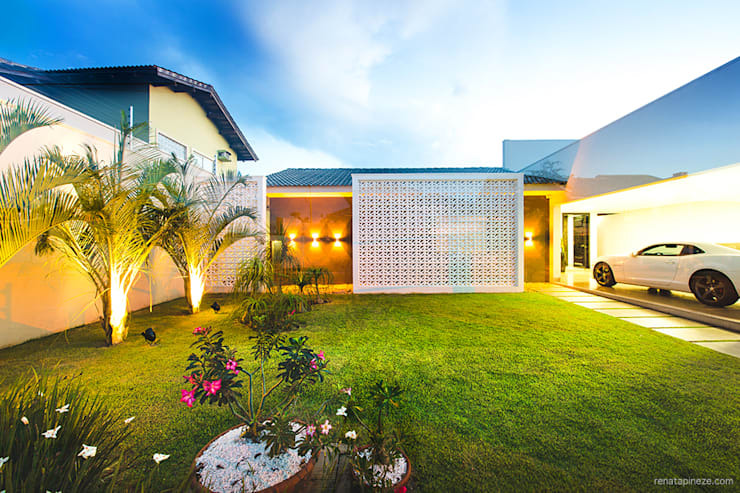 In addition to a place for the kids to play and have fun, your lawn area provides your home with an incredible aesthetic appeal throughout the day and the evening. 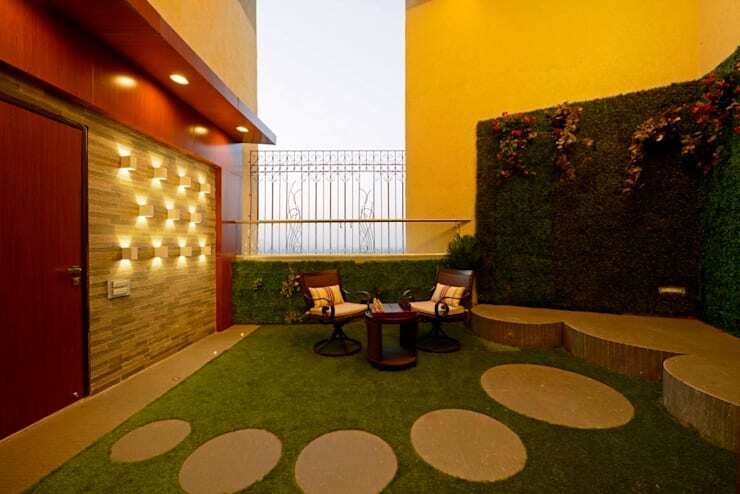 We suggest installing lighting outside in the evening to highlight the beauty of the garden in specific areas. Show off those carefully selected trees and colourful plants! To keep your grass green or shiny, water is essential. An efficient watering system can be achieved in many ways. You can install a sprinkler with a timer or a more advanced irrigation system. Check with a landscape designer about the best option for your lawn! It is beautiful to be able to see the grass and even better if it is framed in a way that highlights the beauty. To do this, we suggest using wood or gravel that allows you to walk around your lawn. It is possible during the season changes that some dry patches will appear in the lawn. This is completely normal and shouldn't discourage you. Just ensure you add new soil and replant the grass and keep it freshly watered. Not all lawns are the same and they don't have to be designed in neat or even squares. 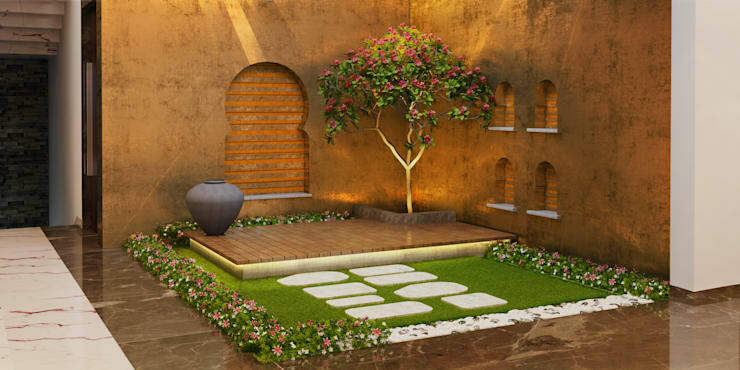 In fact in this design, we can see how the garden is framed by a tile floor that makes for a geometric design. Cutting your grass regularly is another tip to keep it beautiful and maintained. It is best to cut a little at a time but more regularly to keep the grass thick. Sometimes you should also change the direction that you cut the grass. 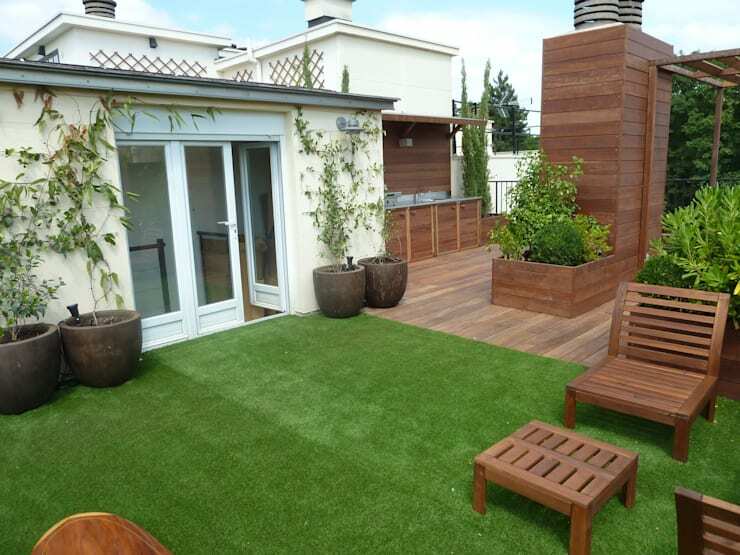 Another way to frame your grass while maximising aesthetic appeal is to use plants. Create planters that border the grass area as well as climbing plants on the walls. This will keep the area fresh and moist and give life to your walls. You should also feed your grass with fertilizer every 4 or 5 weeks. The grass needs a variety of nutrients, but luckily you can find special mixes that have already been put together to feed you grass with. The point of having a garden is to create spaces where you can enjoy the beautiful view as well as the stunning aroma of the flowers and plants that surround you. 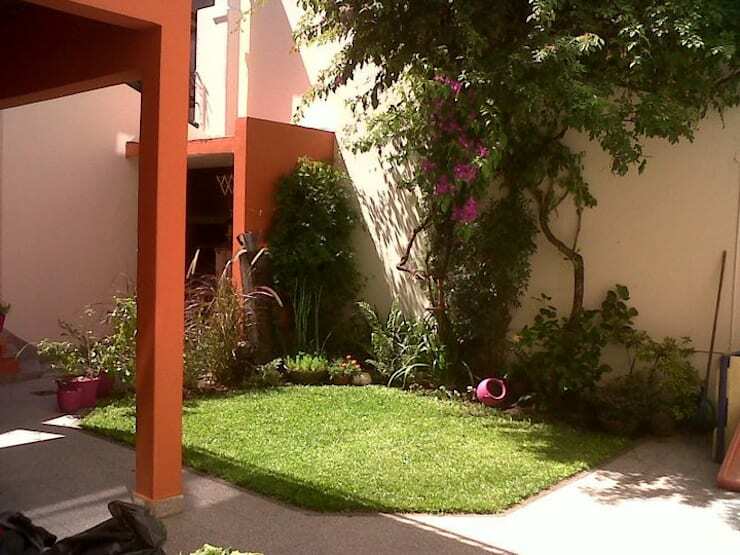 For this, it is vital to think about the design of the garden before installing the lawn. You need to think carefully about where everything will go. Whether an expert helps you or if you're a garden enthusiast yourself, the first step is to measure your garden. This will allow you to consider the space you have available and think about the number of pots you need or if you can fit a bench in! You don't need to overwhelm your garden with grass. 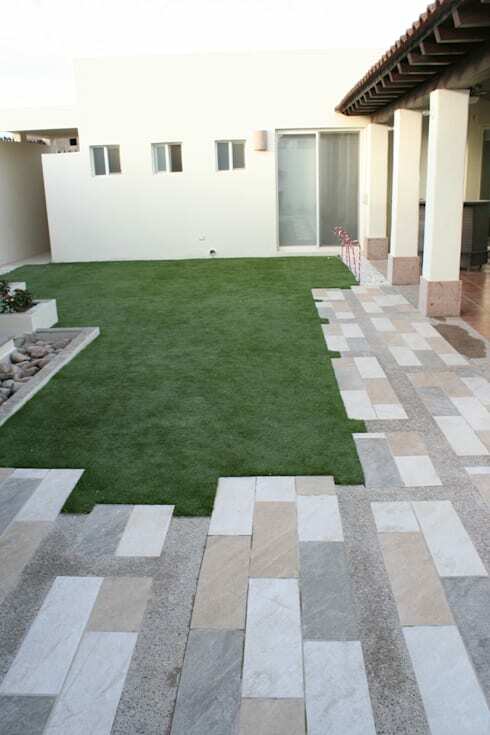 Sometimes you can combine a sleek patio with lawn space. In this design, we can see a wooden deck that can be used for socialising, which features a braai, a bar and chairs. 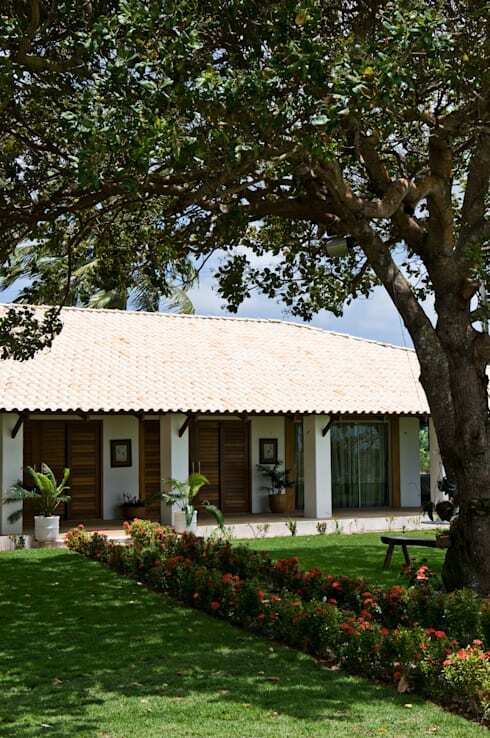 On the other hand is the lawn, which can be used for relaxing in the sun or playing games. One problem that you may battle with when it comes to the garden is the weeds. It is worth addressing this problem straight away because you don't want the weeds to kill your grass! Smaller weeds should be uprooted with a simple shovel. If the problem is more severe, you can use a herbicide. Another way to create a beautiful design within the garden is to separate areas using flowers like we see in this design. They can give a very colourful touch to your outdoor area and make for a bright and beautiful environment. The grass also needs to breathe which is why it's important to use a rake to add some holes to this space, filling them with sand. This helps water to flow better and gives oxygen to the roots. A rake also helps you to remove dead leaves and other dirt, making your garden look pristine. The grass should be accompanied with flawless design. 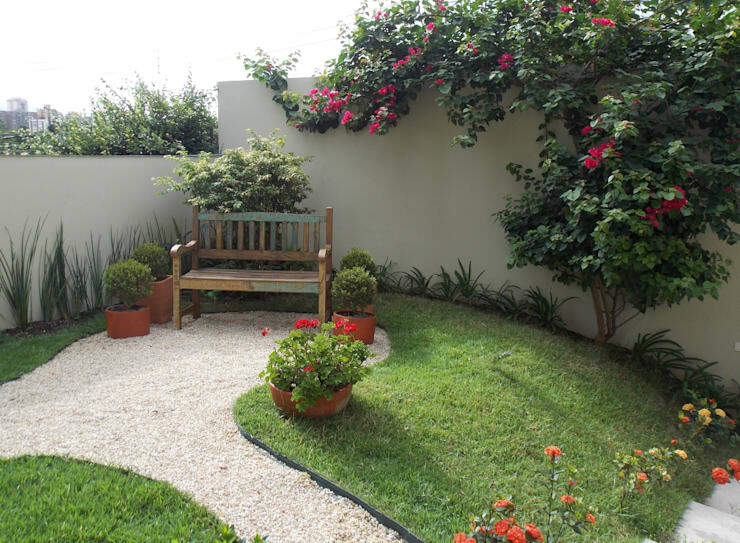 Even if your garden is small, it should feature elements that ensure that it looks very elegant. Adding flowers or pot plants is a simple way to make the exterior space look beautiful. You can also add stone paths, beautiful lighting or a tree. The advantage of glass is that because of its natural beauty, it can be an excellent solution for the backyard but it can also be used to beautify the sides of the house or the front entrance. It is complemented by pot and flowers. Remember that grass changes according to the seasons. You need to be prepared for how to look after it during the year, ensuring it maintains its beauty and vitality throughout. To create a patio design that gives life to your lawn, opt for geometric shapes, whether square or rectangular or curved or rounded. Here we can see how the outdoor furniture makes for a beautiful and functional addition to the space.